Quick post to show ya’ll the trip I took today. 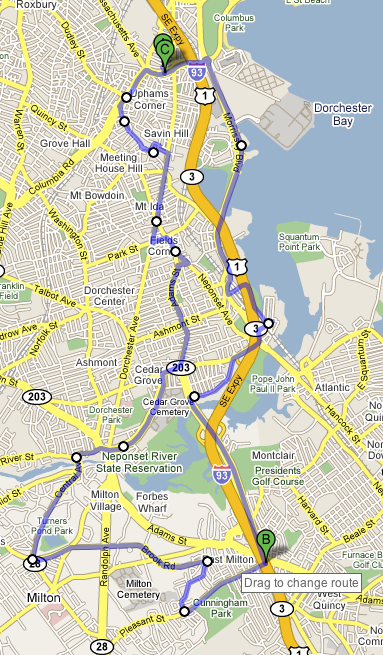 Google says it was a bit over 15 miles, but the path drawn out is not exactly the path I biked but a relatively close approximation. Destination B on the map is the Fruit Center Marketplace at 10 Bassett Street in Milton. If you’re ever in the area (or already live here), I highly recommend checking the place out, it’s got a great selection of fresh fruits and vegetables, a 40 feet salad bar, and meat and fish stores with a large organic selection inside the marketplace. I picked up some very nice looking kiwis, a couple green apples and some organic, free-range, and veggie-fed chicken breasts. Alright, I’m well tired now and am planning on taking another 12-15 mile ride a bit later today so time to go rest and eat for a bit.